Author: Reinhard Klein-Arendt. Series edited by: Bernd Heine, Wilhelm J.G. Möhlig. The main point of interest in this book is that of pragmatics. The aim of the study is to discover the structure-rules of conversation in Swahili and to add to our understanding of everyday conversation. The object texts submitted to the analysis are two plays of one hour total length performed on Kenyan television by an extempore theatre company from Mombasa, called Zingatia. These texts are said to be representative of ordinary Swahili speech as it can be heard daily in Mombasa. The transcripts produced from videotapes do not only record the verbalized aspects of the performance, including paralinguistic variables such as intonation, variation of loudness etc. but also aspects of non-verbal communication such as gestures, mimicry, and significant eye movements. 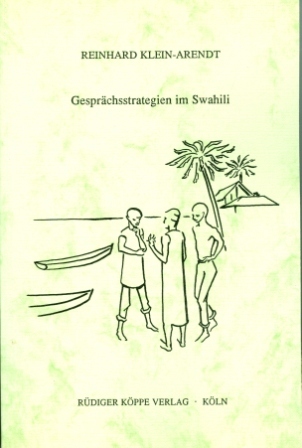 The verbal parts of the texts are given at the end of the volume in two appendices, one containing the Swahili version, the other the German translation. The analysis proceeds in three stages: chapter 3 is devoted to the subject of the organization of talk. Chapter 4 provides a typology of actions and reactions in terms of the strategies which they express. On the basis of this typology, chapter 5 attempts to formulate sequencing rules applicable to pairs of actions and reactions. The analytical part of the book is preceded by a detailed theoretical and methodological discussion. [...] it [the book] contains a wealth of stimulating observations and insights, some of which may have consequences not only for the understanding of natural dialogue in contemporary urban Swahili but also for a fresh approach to long standing problems of the analysis and description of Swahili and of its acquisition as a second language. The book is of great value to everybody interested in pragmatics as conversational analysis. This is so not only because it deals with a non-European language and culture, but also because of the model of analysis proposed and well demonstrated in this book. As a result one arises at the opinion that this dissertation has taken Swahili in practice, i.e. improvisations, only as a pretext to accomplish an excellent scientific exercise.